Consterdine, Peter. Peter Consterdine’s Training Day Seminar. Protection Publications. 2007. No messing around, this video starts as it means to go on with some impact development on the pads. As is usual with a British Combat Association production, a very important point is raised early on; that we shouldn’t be hesitant (and thus inefficient) when attacking. Instead, we should make sure that everything we do ‘explodes’; that it’s fast, committed and decisive. The video goes on to cover stance length and the issues around it, relaxation for impact development in kicking, footwork and biomechanics in kicking, concomitancy when kicking alongside upper-body striking, exposure time and timing in striking, kicking at close ranges, Wing Chun (詠春 ~ yǒng chūn) tactile sensitivity drills (Sticking Hands ~ 黐手 ~ chī shǒu), parrying and blocking drills, recovery and commitment in kicking, intensity, adrenaline, stress, context and setting. 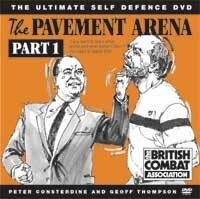 The DVD is unique in that this is the first full seminar Peter has given which covers his own high level martial arts training. Renowned for the “double hip” generating power of his strikes and kicks, this seminar, covered how power is generated and explosive speed with maximum dynamic movement and aggression. All this is shown as well as the key elements in the ultra-fast transitions from punching to kicking and vice versa. This video, in summary, demonstrates a group of men and women taking part in some excellent martial arts training. What sets it aside from other such videos is that it’s done with intensity. My advice to anyone who feels their training is missing something in terms of intensity is to watch this and take on the general feeling of motivation. Essentially, as Peter says at the end, this training session only has a few basic things in it: jabs, crosses, hooks, uppercuts and roundhouse kicks more or less. However, the crucial understanding is how they train these basic things at the British Combat Association. Assistant Instructors who took part in this seminar include Steve Williams, Iain Abernethy, John Skillen and Peter Lakin. This video is available on DVD or for digital download (much cheaper, understandably) from http://www.peterconsterdine.com/store.htm. Further information and a download link can also be found at http://peterconsterdine.com/pctraining.htm.